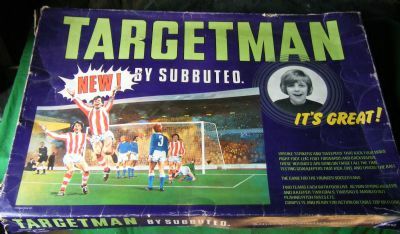 Subbuteo's response to the Striker games from Palitoy and Parker was to create Targetman. 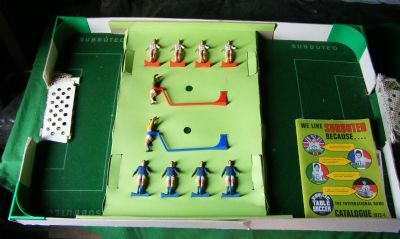 A very similar five a side game to Striker presented within a box that was also the pitch. Novel two footed players but quite poorly designed. An absolutely HUGE box which doubled as the pitch. The image is identical to the Munich box lid but with the kits having been changed. 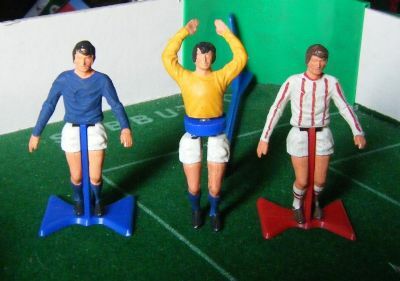 Two five a side teams including keepers, walled pitch (the box tray, two built in goals.